A team of graduate students in Buffalo State’s MPA in public administration program tied for first place in the prestigious 2019 Network of Schools of Public Policy, Affairs, and Administration (NASPAA) Batten Policy Simulation at Rutgers University last month. 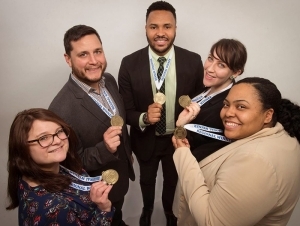 The students, Nikia Brown, Alexander DeSha, Rebecca Masse, Katherine Malik, and Antonio Regulier, shared first place in the competition with a team from Columbia University. Fourteen teams made up from 20 universities participated in the competition at regional locations. 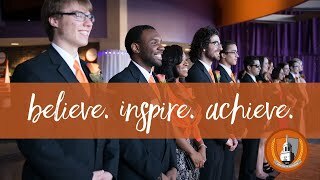 The win qualifies the team from Buffalo State to move on to the final round, where they will compete again international teams. An international winner will be chosen by a panel of expert judges in global migration. In the competition, students from each team represented fictional countries and had to come up with policies to deal with migration. Team members represented different positions in the governments of the countries, like prime minister, labor secretary, and various representatives, Malik said. “We each had those different roles, and then we worked together to try and build a good policy and try it get as many migrants as we could,” she said. The simulation was held over the course of a Saturday, from 8:00 a.m. to 10:00 p.m., leading to long hours for the team, Malik said. Despite that, it was a great experience for the students. The team didn’t expect to win, Malik said, but was thrilled with the result. It helps put Buffalo State on the map.